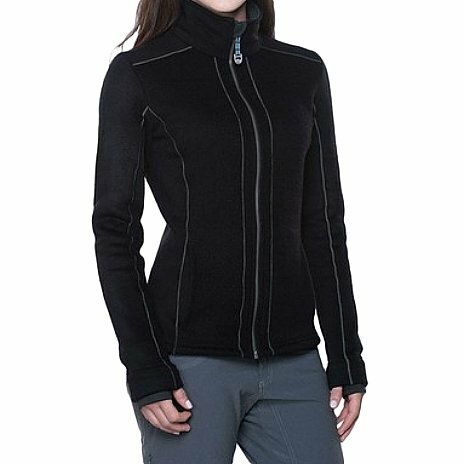 The KÜHL STELLA™ FULL ZIP features ALFPACA GOLD™ fleece for performance, durability and warmth. An upgrade from the original, ALFPACA GOLD uses a ring-spun process for greater softness and durability than open-ended yarn. Knit with multi-toned yarn, ALFPACA GOLD exhibits a richness and depth not seen in other fleece. Sewn with DYNAMIK™ stitching for more stretch and strength than traditional flatlock, low bulk seams make layering comfortable and easy. Princess lines create a flattering, feminine fit. Hand warmer pockets and soft cuffs with KÜHL signature thumb loops seal out the cold.